When I first started blogging in late 2008, I would have never in a million dreamed that it would one day become my full-time job. I didn’t realize that you could actually earn a living writing a blog. Not only that, but blogging has paid me a lot more money than I ever earned in my accounting job. I’m the only one working in our household right now so I’m trying to soak up as much knowledge as I can about blogging and things I could be doing to improve. I didn’t start earning money from my blog right away. It wasn’t until about 2010 that I regularly started to bring in a little extra cash here and there. I sold sidebar buttons on my site and did the odd sponsored post. Fast forward to today and I’ve added a few extra income streams including advertising via ad networks, ambassador programs and various affiliate programs. There was one area that was still a bit fuzzy for me and that was working ad networks. I’ve been with Mode Media (previously Glam) since the beginning of 2011 and they’ve been great for my site. The things that I needed clarification on were all the technical terms like CPM, RPM, passbacks, etc. 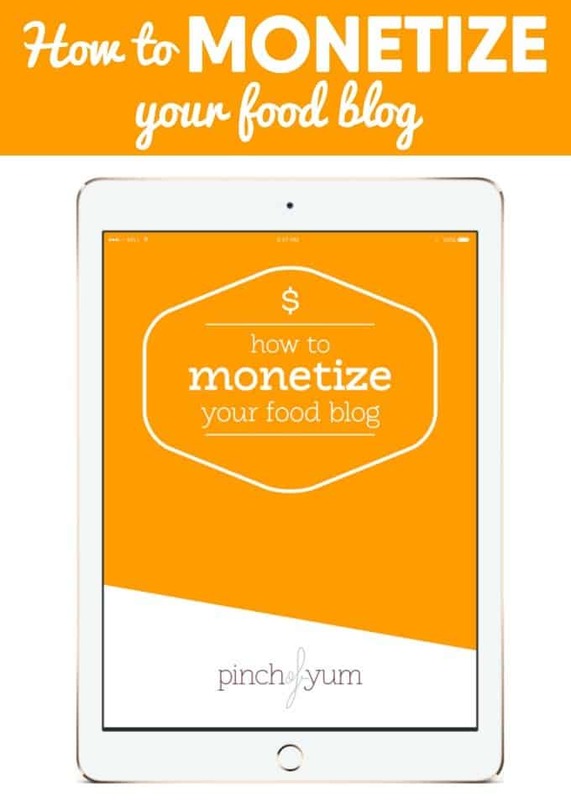 I decided to purchase How to Monetize Your Food Blog by Kiersten Frase of Oh My Veggies! to see if she could offer me any insight. Let me first start by saying you don’t have to be a food blogger to read this book. I’m not a food blogger and I found it extremely useful. The tips and tools I learned can be applied to any type of blog. I found the most valuable section of the book was the section on Ads. She goes into network ads, popular ad sizes as well as Pay Per Click (PPC) Banner Ads and Cost Per Mille (CPM) Banner Ads. I have CPM ads on my blog, but really didn’t give much thought on what the numbers in my ad network dashboard meant. As a result of reading this book, I’ve set up a spreadsheet to track the various ads I have on my site and can now easily see which ones are great and which ones pay peanuts. Time to re-evaluate things! Another helpful section was the discussion on backfill. Your backfill (or default ads) are the ads that show when your ad network isn’t displaying your ads. I’m in the process of setting up an ad waterfall as the book suggests in order to fully maximize the ad space on my blog. I also like how she gives suggestions of ad networks that she uses or knows people who use them. With this kind of information coming from a trusted source, I feel more comfortable in checking out these new networks. The book also talks about affiliate programs and the different types. I personally love Shareasale and it’s mentioned in the book. She also talks about Skimlinks which I only recently started using too. I also found her take on sponsored posts and working with brands to be very enlightening. She offers suggestions for pitching for sponsored posts and what to charge. I also appreciated the word of warning she had about selling text links and guest posts and mentions how these types of SEO firms try to game the system. I don’t sell any products on my blog, but if you or plan to, there’s information in the book as well. She talks about selling e-books, services and other products. She also discusses contributing to other blogs and print publications and why it’s not good to work for “exposure”. She briefly touches upon Paid Recipe Development, Photography and even Book Deals! In the Appendix, she has a guide to ad networks and lists the various ones she has had experience with and some information about each one including whether they are 1st tier, 2nd tier, 3rd tier in terms of CPM. I also found the glossary of ad terminology very helpful. As a result of this book, I’ve set up my own version of her Revenue & Ad Tracking Spreadsheet. She also has a sample media kit and rate sheet included and that is on my to-do list to see if I can revamp mine. How to Monetize Your Food Blog cost me $15 and it was worth every penny! I printed it out and keep it on my desk and refer to it often. It definitely opened my eyes more when it comes to earning money blogging! Note: This ebook is now owned by Pinch of Yum. This post was previously published on May 19, 2014 on my blogging blog. I’m closing that blog down and moving the content over here. Keep an eye on my Blogging tips category! Want to start a blog? Read my post about how to start a lifestyle blog. Disclosure: I purchased a copy of How to Monetize Your Food Blog on my own. This post contains affiliate links. Very interesting. I’d like to read this. No, default ads are the ones that show when your main ads aren’t showing. I think what you mean has to do with cookies. If you search for something, you’ll then see ads targeted to you based on whatever it was you were looking at. I notice it too!